Ankle Stabilizer – Pacific Medical, Inc.
Contoured low profile design for better fit and patient comfort. Removable medial and lateral stays are heat formable. Figure of eight straps secure the ankle to control inversion and eversion while stabilizing the calcaneus. 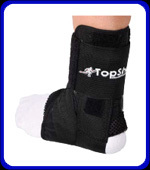 Designed for ankle sprains, chronic ankle instability and prophylactic use. 501922 X - Small 10" - 11"
501923 Small 11" - 12"
501924 Medium 12" - 13"
501925 Large 13" - 14"
501926 X - Large 14" - 15"
* With sock on, measure circumference of ankle from the base of the heel around ankle.